Demeter might not be the most famous of Greek goddesses, but in antiquity she was one of the most important. Demeter was one of the deities of Mount Olympus, a sister to Zeus, and the goddess was widely revered for her role in agriculture and food production. 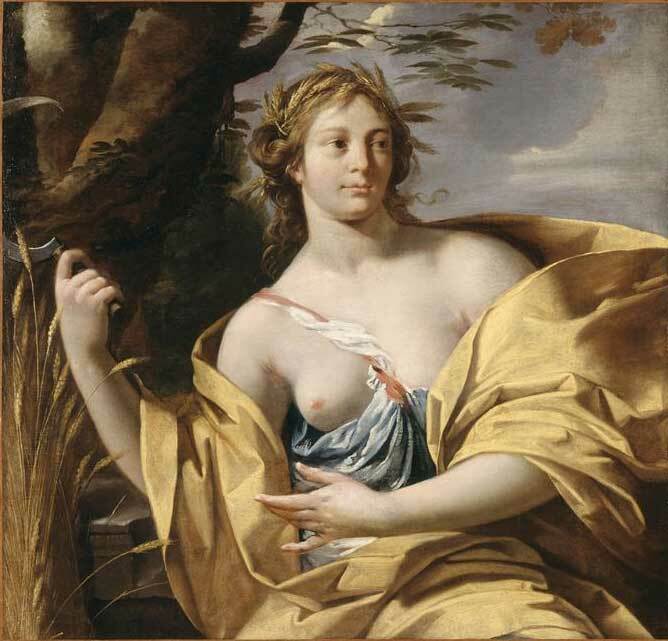 The goddess Demeter was born during the period known as the Golden Age of Greek mythology, the time when Cronus and the Titans ruled the cosmos; indeed, Demeter was the daughter of Cronus and Rhea. This made Demeter sister to Zeus, Hades, Poseidon, Hestia and Hera. Demeter though had no childhood for when Rhea gave birth to her, Cronus immediately swallowed Demeter, imprisoning his daughter within her stomach. Cronus was afraid of a prophecy which stated that he would be overthrown by his own child, and so Demeter was joined in her prison by Hades, Poseidon, Hestia and Hera. Demeter’s brother, Zeus, would escape this fate and would lead an insurrection against his father, having first released his siblings from the imprisonment, by forcing Cronus to regurgitate them. The insurrection would result in a ten year war, the Titanomachy, although it is generally said that Demeter did not fight during the war, but was instead given over to the protection of Oceanus and Tethys for the duration of the conflict. Zeus would ultimately emerge as the supreme deity after the Titanomachy, and would make his sister Demeter one of the first six Olympian deities; and the roles previously undertaken by the Titan gods and goddess were then divided amongst the new generation. Demeter is normally named as the Greek goddess of Agriculture, a role which saw Demeter closely linked to the growth of fruit and vegetable as well as grain. Some sources it was Demeter who first created grain, growing and harvesting upon Sicily before spreading the knowledge to mankind; and of course being so closely linked to grain, Demeter was also the Greek goddesses most closely associated with the making of bread. Less obviously, Demeter was also a Greek goddess associated with Law and Order, being one of the goddesses who instructed man in legal practices; and Demeter, through the Eleusian Mysteries, was also a goddess associated with the Afterlife. An important aspect of any Greek deity was their partners and offspring, and as might be expected Demeter had a number of lovers and children. Amongst the most famous lovers of Demeter were Zeus and Poseidon; and the union of Demeter and Zeus would produce the goddess Persephone, and in some ancient sources it would also produce the first incarnation of the god Dionysus. Poseidon would force himself upon his sister. Demeter would attempt to escape by transforming herself into a horse, but Poseidon then transformed himself into a stallion to mate with Demeter. This relationship brought forth Arion, an immortal horse owned at one time by Heracles and Adrastus, and Despoina, a goddess of the Arcadian mysteries. Demeter also had mortal lovers. The first of these was Iasion, a prince of Arcadia and brother of Dardanus. Demeter would have a brief relationship with Iasion during the festivities surrounding the wedding of Cadmus and Harmonia upon Samothrace. The relationship was brief, for when Zeus discovered the tryst, he killed Iasion with a thunderbolt in a pique of jealousy. Nevertheless, two sons were born to Demeter, Plutus, the god of agricultural wealth, and Philomelus, the inventor of the wagon and ploughing. A second mortal lover of Demeter was Carmanor, King of Tarra upon Crete, and by him Demeter bore Euboulos, Greek god of the ploughed earth, and Chrysothemis, a Greek goddess of the harvest festival. Some sources also name the Athenian youth Mecon as a lover of Demeter; Mecon was subsequently transformed into a poppy plant by the goddess. 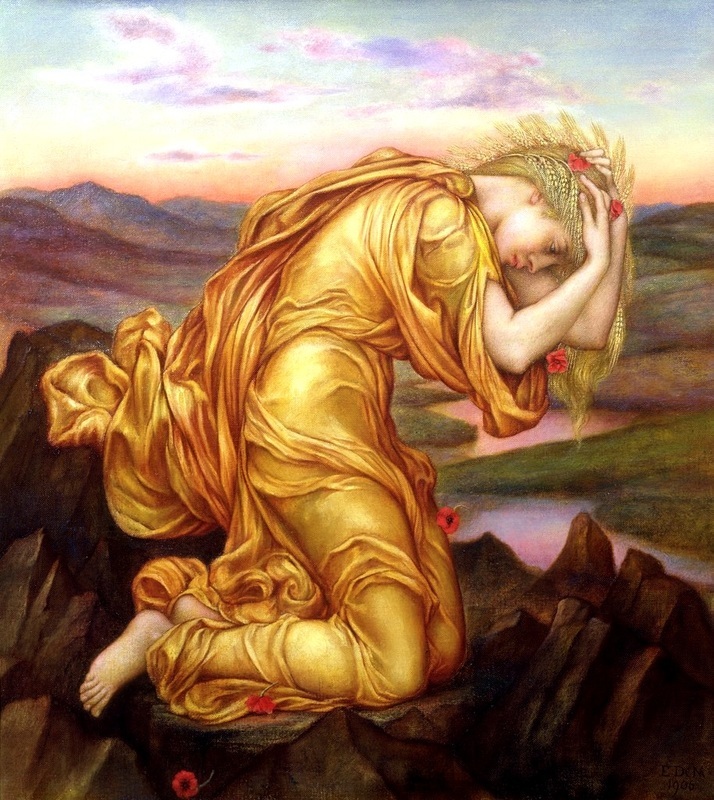 Demeter is now most closely associated with one daughter, though and many of the myths connected with Demeter relate to the abduction of Persephone. 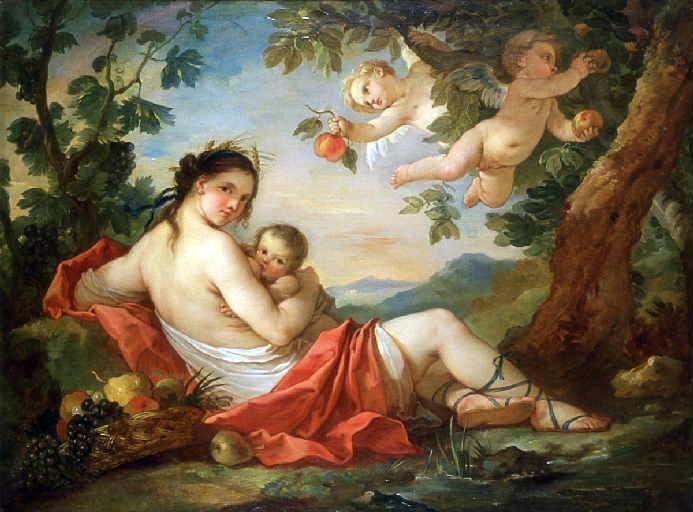 Demeter and Persephone were perceived as inseparable, for mother and daughter would live in the same palace upon Mount Olympus. The two would forcibly separate though, when Hades decided that he needed a queen to rule alongside him in the Underworld. Hades set his eyes upon Persephone, and when the daughter of Demeter had wandered away from her attendants to pick flowers, Hades pounced and abducted his niece back to his realm. Demeter soon noticed the absence of her daughter, but no one could explain what had happened to Persephone. Thus for nine days Demeter searched the earth for Persephone, and whilst she did so, Demeter neglected her role as Goddess of Agriculture, and crops failed, with famine enveloping the whole world. Eventually, Helios, the sun god who sees all, told Demeter about the abduction of Persephone by Hades, but this information alone did not allow for mother and daughter to be reunited, and eventually Zeus had to intervene for the whole world was crying out. Some say it was Zeus who had enticed Hades to abduct Persephone, but now Zeus had to bargain with his brother, and as a result it was decided that for one third of the year Persephone would stay with Hades in the Underworld, and for the rest of the year, Demeter would be reunited with her daughter. The separation and reunification would bring about the growing seasons, for when together crops would grow, but when Persephone was in the Underworld, ground would be left fallow. Demeter was no different from any other deity of the Greek pantheon, being quick to anger and display her wrath, but also quick to display favour when there was call. Ascalabus - Demeter would transform Ascalabus into a gecko when the Athenian youth mocked the goddess as she drank litres of water without stopping for breath. Lyncus - Likewise, King Lyncus of Scythia was transformed into a lynx after the king had tried to kill Triptolemus, one of Demeter’s favoured mortals. Colontas - Colontas would be killed by Demeter, when she burnt down his home, following his failure to offer hospitality to the goddess. Caranbon - Caranbon, a king of Thrace was also killed, this time by two serpents sent by Demeter, after the king had killed two flying serpents who pulled the chariot of Triptolemus. Erysichthon and Triopas - Two kings of Thessaly were punished by Demeter in the same manner. King Erysichthon cut down the oaks of a sacred grove, whilst Triopas demolished a temple of Demeter, and in retribution both men were cursed with unquenchable hunger, so no matter what they ate, the hunger would never be sated. Phytalus - Phytalus, a man of Eleusis gladly received a disguised Demeter into his home, and so was rewarded with the first fig tree. Trisaules and Damithales - Similarly, Trisaules and Damithales from Arcadia, also welcomed Demeter, and so were given various crops as a mark of gratitude. Men of Eleusis - The men of Eleusis, most notably Celeus, Diocles, Eumolpus and Triptolemus were especially rewarded for their hospitality. Celeus would be given the gift of agriculture, whilst Triptolemus would become a prophet for the goddess, teaching all mankind the agricultural knowledge of the goddess. These men were also instructed in the ways of the Mysteries. Plemnaios - A king of Sicyon, Plemnaios would see his only surviving son Orthopolis blessed by the goddess when Demeter felt sorry for the loss of all his other children upon their birth. Another story tells of the transformation of the Sirens by Demeter, although whether it was a curse or a favour depends on the ancient source being read. ​The Sirens were originally the attendants of Persephone who had not prevented her abduction by Hades, Demeter was said to have given these nymphs wings to allow for a greater area to be searched. Some say how the Sirens kept their good looks, and some say how they lost their beauty during their transformation by Demeter. It was whilst distracted by the absence of her daughter that Demeter famously attended a banquet hosted by Tantalus. Stupidly, Tantalus had decided to serve up his own son Pelops as the main course, and whilst all the other assembled gods realised what had happened, Demeter unwittingly ate Pelops’ shoulder, and so when the son of Tantalus was put back together, Demeter crafted a bone of ivory so that Pelops could be whole again.